The Expanse has been saved! Amazon has closed a deal to pick up the sci-fi drama series, which is in its third and final season on Syfy. The announcement was made tonight by Amazon’s boss himself, Jeff Bezos, during The Expanse panel at National Space Society’s International Space Development Conference in Los Angeles. Syfy canceled the show after three seasons. Fans rented a plane to fly over Amazon Studios to help revive The Expanse. Syfy recently canceled the series after three seasons. 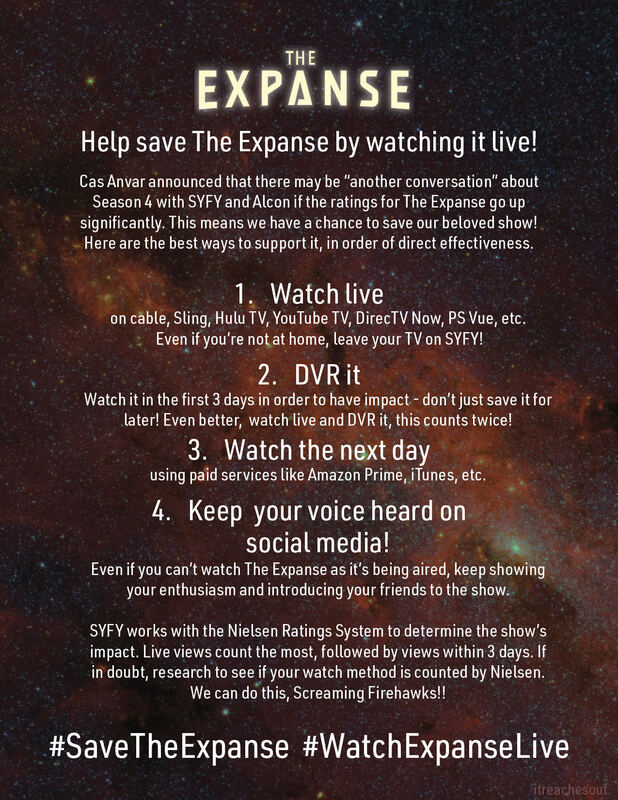 Since the cancellation, fans have gathered on the show’s Reddit page to come up with creative ways to convince Amazon to save The Expanse. Imagine canceling “Game of Thrones” before the Red Wedding. That’s what just happened to “The Expanse.” When fans cry out for someone to save their show, the narrative is usually built around somebody “not getting it.” The network, the studios, or some bean counter or idiotic executive just can’t recognize the genius of the program that they’ve killed and the heartbreak they’ve caused.